Mattimeo, the son of Matthias the great champion and warrior of Redwall, is always in trouble, or so it seems. In the company of his two friends Tess and Tim Churchmouse, Matti is forever finding new scrapes to get into and sometimes out of. This time he has outdone himself and he is in disgrace. He has been fighting with Vitch the rat again and fighting is simply not tolerated in Redwall. So, Matti is kept busy running errands and doing chores to help prepare for the great summer feast. Unfortunately someone else is also preparing for this event. Slagar the Cruel, a fox with a vengeful and vindictive heart, is determined to make Redwall pay for an imagined wrong done to him. Soon he and his vermin followers have Mattimeo and several other Redwall young ones in his grasp, kidnapped from Redwall and destined for a life of slavery. Matthias and his friends are determined to retrieve their children and to punish Slagar for his duplicity and his cruelty. Thus begins an epic adventure as Matthias and his followers chase after Slagar. In his absence Redwall has its own problems when a terrible Raven from the Northlands, General Iron Beak, decides to take over the abbey for himself and his supporters. What follows is a battle of wits, each side trying to outdo the other. Can the Redwallers defend the abbey without the help of their champion and is Matthias going to be able to get back his son and the other young woodlanders. In this thrilling Redwall story the reader will find a cast of wonderful characters who will delight, amuse, and enthrall. Among others there is Basil Stag Hare, a hare with a big heart and an enormous appetite who is funny and loveable with his outrageous hare speech and his odd mannerisms. Then there are the band of shrews, led by their Log-a-Log, who are fearless and steadfast in their support of Matthias and his quest. 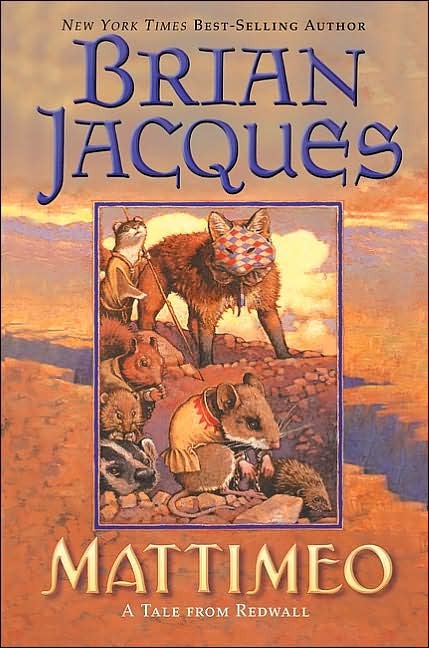 Once again Brian Jacques has created a novel that will keep the reader's nose firmly glued to the pages, and that will reinforce the power of these exceptional stories about the creatures of Redwall, Salamandastron and the other places in Brian Jacques' world.